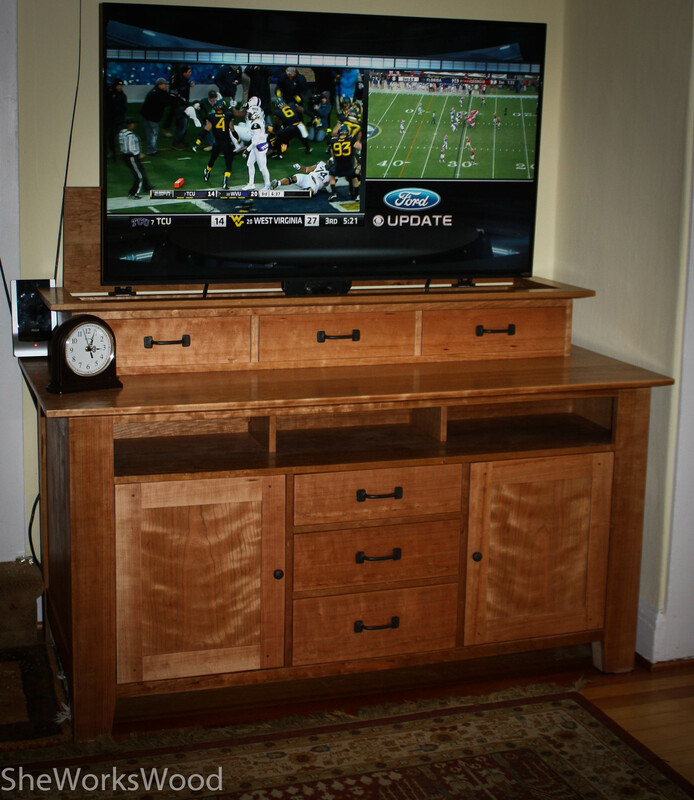 The TV Lift cabinet is finally finished and its hard not to reflect on the year it has taken me to finish this project. Its been an interesting year. No doubt this project would have taken longer than normal for me to complete, but around the first of the year, my knee blew up and I was out of the shop for a couple of months trying to sort out what was wrong and rehabbing it. In the midst of that, my spouse’s mother lost her fight with cancer and passed away at the end of January. We had a glorious summer here but my knee issues prevented me from hiking which is usually a major component of our summer. 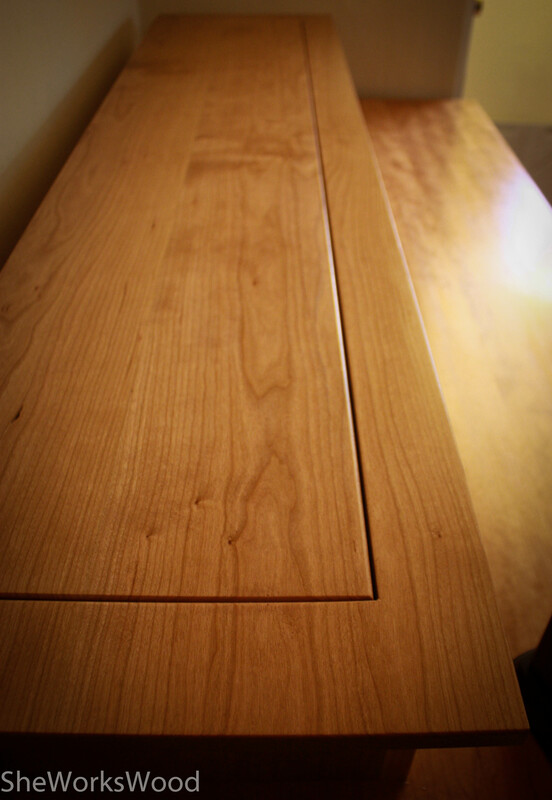 I was, however, able to get back into the shop and make progress on the cabinet. Finally, in October, my father passed away after a many year struggle with Parkinson’s. Since I was so late to woodworking my Dad never really got to see or understand what I was doing. His Parkinson’s trapped him in Texas and inhibited his ability to enjoy with my my new found passion. 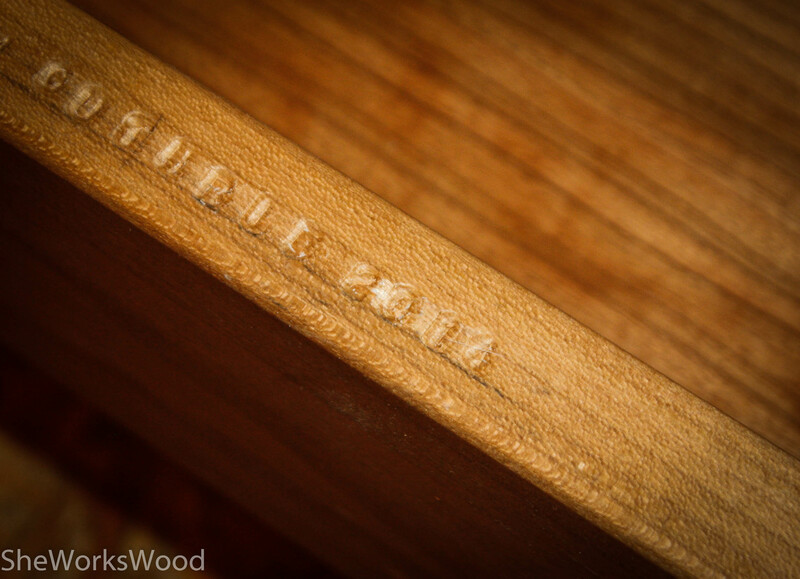 I will miss him and wish, as I often do, that I had started woodworking sooner. It would have been a wonderful thing to share with him. So here are the glamour shots of the TV Lift cabinet. I’m very excited to have this in place and doing what it was designed to do. 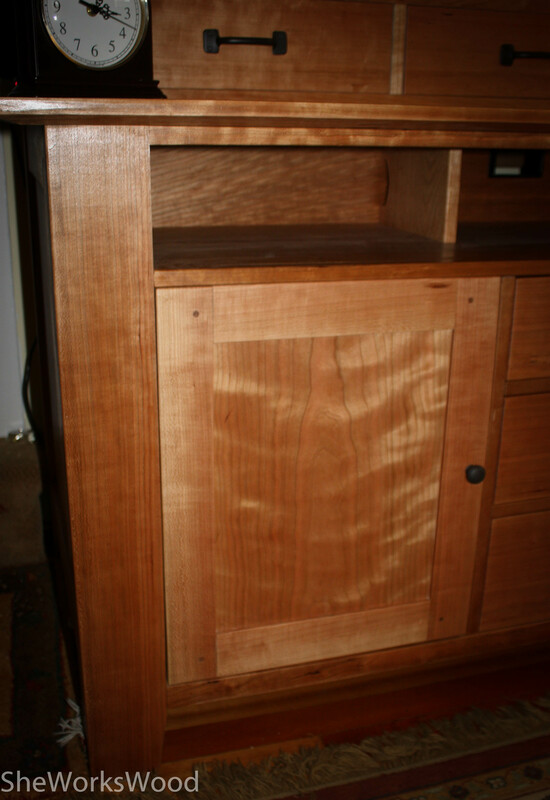 Second view of the cabinet. Click on the picture to see it in action. 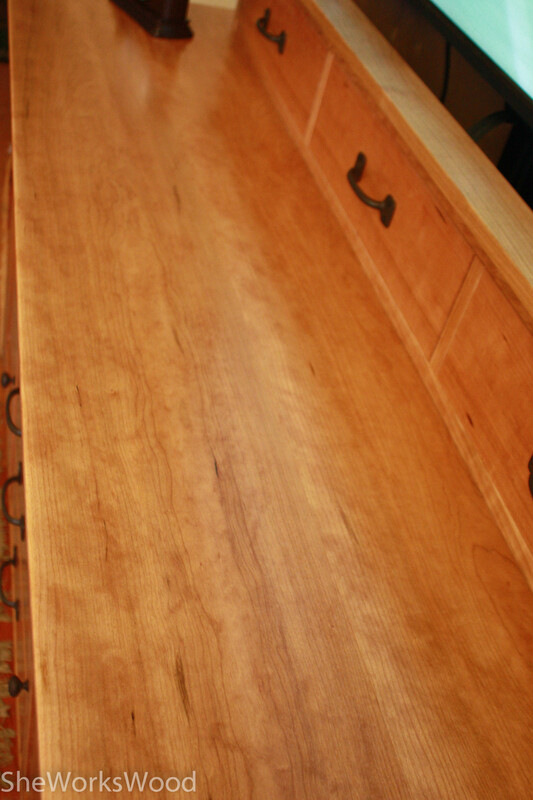 This entry was posted in curly cherry, TV Lift Cabinet and tagged curly cherry, TV Lift Cabinet. Bookmark the permalink. 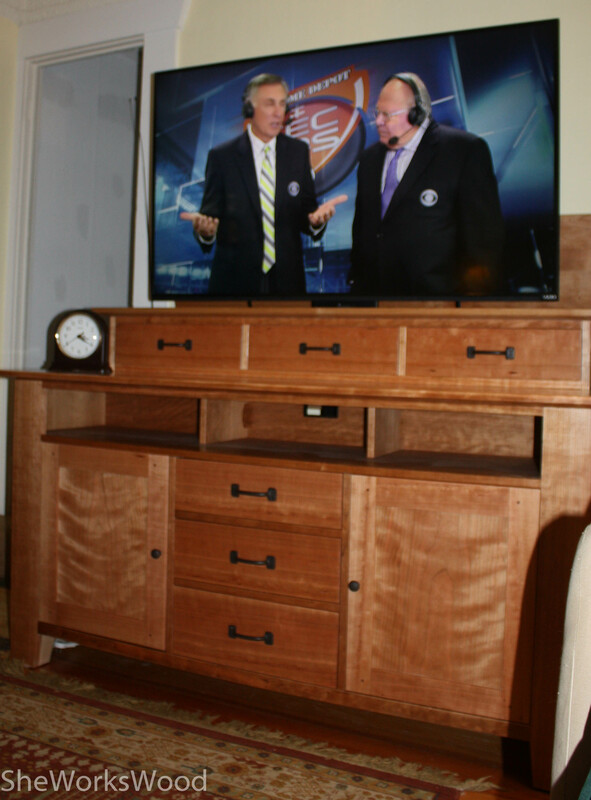 The TV cabinet looks and works awesomely. I’m sorry to hear 2014 has been so trying. Here’s to an easier 2015. Way to hang in there through all those intense trials. Working with our hands helps to keep us on track. This cabinet will forever speak to you as an important milestone in your life. Great job. Your soooo right. Having my projects to help center me was a big part of this project. Thanks so much! Marilyn, the cabinet looks wonderful…especially with that screen of talking heads discretely hidden. Do you ever have the tv on, but with it out of sight? Sort of a chance to re-live radio days. Or scare the cats. It is sad that you were not able to share your woodworking passion with your father, as it is marvelous, both in results and your processing of it. Cool that you think of him as you play in the shop. Thanks for sharing with us ’cause we are proud of you. May the coming year be fulfilling and not as drama-filled. Leave that drama stuff to the young’uns. Great job on a very large project. The panels in the doors are especially attractive. You have a good eye for wood selection. Sorry you’ve had family losses and health issues, hope you get a long break from those kind of challenges now. It is really beautiful and well worth the time. I am sorry about your losses and knee problem in 2014 and hope that 2015 will be a better year for you. 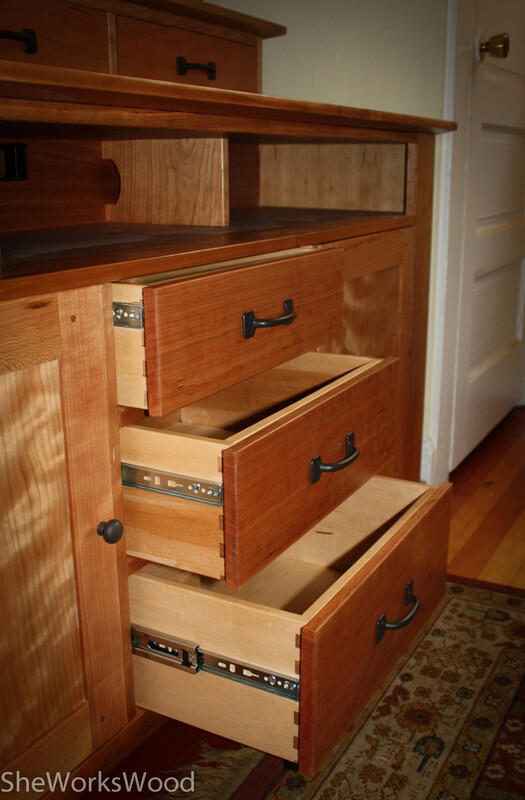 Great work – I think that is a beautiful cabinet. After Ananda and I left on Saturday, we stopped at Chuck’s Hop Shop near your house. Why didn’t you tell us you had an amazing beer store near your place! I might be over every weekend now!! Because .. I didn’t know about Chuck’s Hop Shop .. where is it? Beautiful, beautiful work. The flame/quilting on the door panels is fantastic. Sorry for all the struggles and loss of the year. I hope this beautiful piece will be a highlight that illuminates your memories of this year in the future. Marilyn, that is a beautiful piece!!!! Hi Marilyn, what a stunning cabinet. I love seeing other people’s projects, you clearly have a passion for the trade and a command of the skill. I’m sure your father is looking down on you with great pride. I love seeing other’s projects as well And yes, I love the thought of dad looking on. Thanks for your kind words. My favorite part is the matching panels. Very impressive for hand resawing. I’m a little late to the game but let me reiterate what the other folks have said: the piece looks amazing. Also, thanks for sharing your story with us. It helps keep things grounded and in perspective. It also reminds us of why we frequent each others’ blogs and musings: we’re humans and the human connection is much more compelling than anything else. I too, am sorry to hear of your family’s loss this year. I hope you and your partner find solace in the happy times spent with your parents. Thanks so much. I really appreciate the feedback. And hopefully it also helps explain my current project, the flag box.